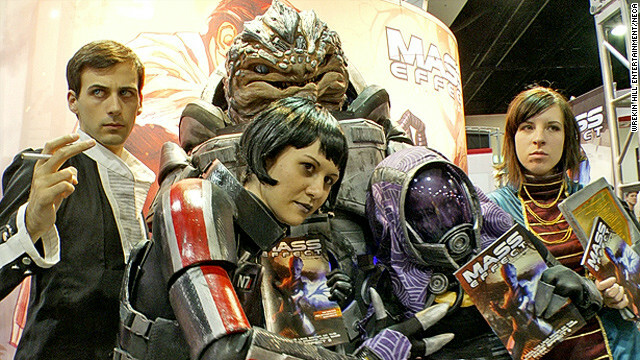 Holly Conrad, center, and her "Mass Effect" cosplay team in "Comic-Con Episode IV: A Fan's Hope." How exactly does one make a documentary about an event that attracts hundreds of thousands to San Diego, with dozens of events going on at one time? "We had a 150-person crew over the course of filming," said director Morgan Spurlock ("Super Size Me"), who took on the challenge of shooting a movie about San Diego Comic-Con in 2010, his biggest film yet. Lucky for him, geek icons Stan Lee, Joss Whedon and Ain't It Cool News' Harry Knowles soon signed on to produce the documentary, "Comic-Con Episode IV: A Fan's Hope." After an arduous casting process, Spurlock chose to follow several attendees, all of whom had a goal to accomplish at the convention. “I love Anthony Calderon, racing to Comic-Con just to get the 18-inch Galactus he can only get at Comic-Con," Spurlock told CNN Geek Out. Another favorite of Spurlock's is Mile High Comics owner Chuck Rozanski, whose struggles to sell comic books at Comic-Con are chronicled in the film. "(He) represents this crossroads of the old guard and the new guard. How do you remain relevant and parlay that into this next generation?" he said. However, the thing that stood out the most to Spurlock was that Comic-Con also functioned as a "geek job fair." He followed artists Skip Harvey and Eric Hanson and costume designer Holly Conrad, who sought to break into the world of comics, film and gaming. “Originally, you think (Comic-Con is) a geek shopping mall," Spurlock said. "There’s so much more going on, with the panels where people can go and learn about breaking into the business, to the portfolio reviews, where you can show your work and get hired to work on comic books, to and creating costumes for the masquerade, and people in the costume business could hire you to work in the costume department." 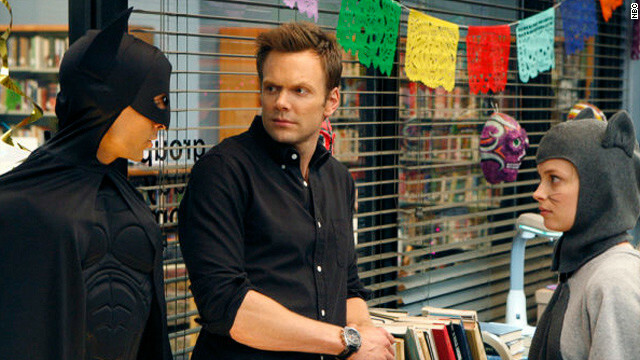 Danny Pudi's character, Abed, shows off his Batman costume to first season costars Joel McHale and Gillian Jacobs. Oh, “Community,” how I’d missed you! After a far-too-long hiatus that had fans thinking “cancellation,” the brilliant, criminally underrated NBC comedy about a motley crew of community college students returned last week. Count me among the faithful who will be ignoring telephone calls and loved ones from 8 to 8:30 Thursday nights. There are so many reasons fans enjoy this show, from the stellar cast to Greendale Community College’s Dean Pelton (Jim Rash), who has penchant for drag and extreme political correctness (The school mascot is the Human Being). But “Community” is more than a great comedy in the general sense. It’s the geekiest show on television. This is not a knock against “The Big Bang Theory,” a show that I watch and enjoy. However, where “BBT” takes a much broader approach in serving up nerd culture, “Community” is more sly and sharper in its comedic delivery. And boy, does it deliver. Back in 2007, when the "Back to the Future" ride was shut down at both Universal Studios theme parks in the United States (in favor of a "Simpsons" ride, though there is still a "Future" ride in Japan), it might very well have been seen as a sign from the powers that be that the interest in the 1980s sci-fi comedy trilogy just wasn't there anymore. Since then, something funny has happened: Christopher Lloyd started popping up in commercials in Argentina, in character as his most famous character, "Doc Brown." Replicas of Marty McFly's famous 2015 Nike shoes went on sale in September. 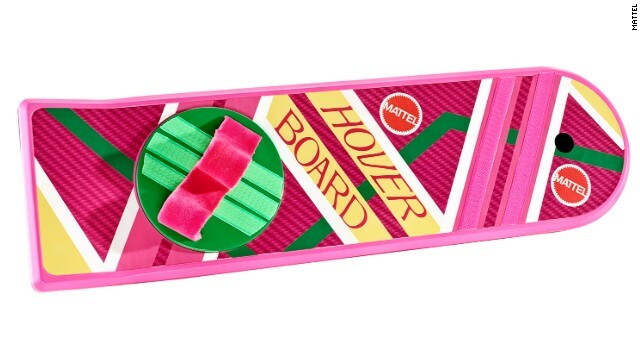 Now, replicas of the hoverboard, perhaps the most famous piece of "Back to the Future" lore from 2015, are being made available for pre-order by Mattel, the same company that, in the world of "Back to the Future," put the product out in the first place. Bob Gale, producer and co-writer of the "Back to the Future" movies, was just as surprised as any other fan when he heard about the hoverboards. “I had no idea about it until it was announced at New York Toy Fair," he said. "I checked it out and called up our licensing person at Universal to find out about it." Soon Gale was meeting with some of the people at Mattel, with some of his actual hoverboard props in tow: “They were so excited to have their hands on the real things. They had booklets of paint swatches to match the exact color." Why so much excitement over a board? Gale recalls the demand for them was overwhelming when "Back to the Future Part II" was released in 1989. "Bob Zemeckis did a very tongue in cheek interview and, totally straight-faced, said ‘Hoverboards have been around for years and parents’ groups wouldn’t let it on the market.’ Oh man, did that catch fire," said Gale. "Someone from Mattel was totally aggravated that we put [their logo] on the hoverboard because kids were calling and writing and convinced that somewhere there must be a stash of hoverboards they weren’t able to market." Scott Neitlich, marketing manager at Mattel, said the company is happy to finally make this a reality: "We've been looking forward to making a prop replica for years." The company saw a similar level of success with replicas of "Ghostbusters" PKE Meters and ghost traps. Though we're three years away from hoverboard technology (and they still won't work on water), the Mattel hoverboards will "gently glide over most flat surfaces," with accompanying sound. Gale said he thinks the enthusiasm about these items (not to mention fan creations like mini-flying DeLoreans), shows that the "Back to the Future" fan base is alive and well. “Had [Universal Studios] not made that decision to dismantle the ride when they did, had they put it off until the 25th anniversary, they might have said, ‘Maybe we ought to keep "Back to the Future" going. Maybe if enough people write in, they’ll take half of 'The Simpsons’ ride and turn it back into ‘Back to the Future.’"
The fan community for "Back to the Future" has gathered at sites like BTTF.com over the last several years. CNN Geek Out spoke to Stephen Clark, creative director for the site, and a few of his compatriots, all of whom are placing orders for hoverboards, anxiously awaiting their arrival in November. The cast and crew of HBO's "Game of Thrones" at San Diego Comic-Con 2011. First, there was South by Southwest, the annual music and interactive festival in Austin, Texas, which just kicked off its 2012 event Friday. Then there was "South by Star Wars," a Tumblr, Twitter account and hashtag that, in its third year in 2011, imagined an alternate version of SXSW, if it took place a long time ago, in a galaxy far, far away. Here's a sample tweet that pokes fun at the various panels at SXSW and one of the most popular "Return of the Jedi" characters: "Only 10 min til big Keynote by Admiral Ackbar: 'It's A Trap' is just another way of saying 'It's An Opportunity.' "
The popular meme, used by SXSW attendees and nonattendees alike, now has a sequel: "SXSWesteros," based on the George R.R. Martin book series and HBO series "Game of Thrones," which takes place in the land of Westeros. One example of a "SXSWesteros" tweet (referring to the oft-repeated "Winter is coming," in the books and series): "But Really, Is Winter Coming? – New Meteorological Techniques from the Citadel." 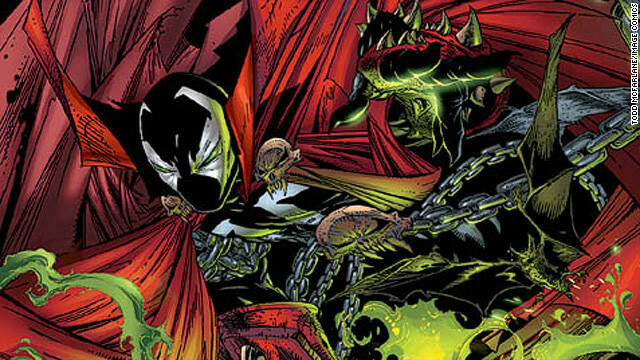 Art from the cover of "Spawn" #1 from 1992. When Kyle Puttkammer opened his comic book shop 21 years ago, he didn't know he was witnessing an event that would change the industry forever. “Back in 1991, there was a wave of interest in superstar artists," said Puttkammer of Galactic Quest Comics, Games & Toys, which has two stores in Georgia. "All of these artists were generating a following." How important was Image in the 1990s? The company made a "huge difference in our business," Puttkammer said. “Image was the first to say, we’re artists, we want to put our best foot forward when it comes to presentation," Puttkammer noted. "It might cost a little bit more but the paper quality’s gonna be better. It’s gonna be glossy, heavier stock." The company was an overnight sales success. Filed under: Comic Longbox • Image Comics • Squee!